Water resistant 3-ply fabric which allows evaporation of condensation from beneath the cover. Nylon securing straps and buckles with elasticated hem for secure fit with extra strong double seams. Zips on both sides for easy access. 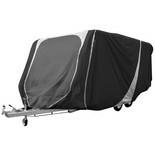 Breathable caravan cover made from durable 3-ply fabric.